This is an unusual topic to be blogging about in relation to cricket. Or is it? Over the past few years, I have become increasingly aware that there are cricketers who bowl with one hand yet bat with the other. So, they must be ambidextrous- right? Nope. They might be, but are not necessarily. This is about a thing called 'mixed dominance' or 'cross dominance'. It is all about how the brain determines motor skill manifestation. All of us have a dominant hand, eye and foot. In a mixed dominant person, these are not all lined up. For example, you could be right footed and right handed, but left eye dominant. Therefore you would perform some tasks with your left hand and others with your right. Ambidextrousness is a form of mixed dominance where the two sides are equally proficient. So, this stuff becomes apparent in cricket where we see batting and bowling. The majority of players are all Left or all Right. But there are a few special ones who are a bit of both. Trent Boult was the one who jogged my memory. Watching him bowl recently, I saw that left arm going over his head in the normal fashion. But when he came out to bat, he was a Righty! I had to double check that and looked him up online, and sure enough, he's a Righty Lefty. 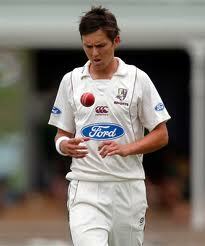 After further investigation, I found his brother JJ Boult is also one of them, but he's the opposite- he's a Lefty Righty! So that started a conversation, who else do we know that's a Lefty Righty or vice versa? Straight away, I had a list of New Zealand cricketers that I had noticed. Then I looked at recent Aussies. Then I discovered that mixed dominance may be advantageous in sports where there is a side on stance- like cricket, baseball, or golf. The dominant eye faces, and the dominant hand controls the swing. There is also a common theme with the mixed dominant sportspeople, that they often have exceptional hand eye coordination. Casting the net a bit wider, I discovered other notable sportspeople who are mixed dominant and also known for excellent hand eye coordination. Sachin Tendulkar is a classic example.The Little Master has scored 15,533 test runs. He bats, bowls and throws Right Handed, but he writes Left Handed. He is also known for practicing in the nets with Left Handed throws. David Gower, who played 117 tests, scoring 8231 runs for England is another Lefty Righty. He was a Left Hand batsman, but bowled Right Handed. He also plays golf, hockey, kicks a ball and writes Right Handed. David Gower was also known for being ambidextrous in the field. Maria Sharapova was noticed for her hand eye coordination even before she started school. She later developed into the tennis player we know today, and is a Righty Lefty. Rafael Nadal is similar, but the reverse- he's a Lefty Righty. Closer to home, I have a son who is a Lefty Righty. He bats Left Handed, but bowls Right Handed. He kicks a football with his Right Foot, but can also do Left, plays hockey Left Handed, plays tennis with one hand for forehand and the other for backhand. He writes Right Handed. He is also known for his excellent hand eye coordination and sporting ability. He was the one that started me researching this, as he noticed cricketers that were like him, and he wondered why. So Trent Boult, Jacob Oram and Jesse Ryder are closely watched by one small cricketer in our house. He relates well to them, wants to be more like them. Richard Hadlee is also an idol. He read all about Hadlee in one of his cricket books a few years back and announced "he's just like me!" well, not quite, but it's good to have something to aim for. Fantastic piece! And I've learnt something about mixed dominance - I fit into that category. Nice comparison o he Boul brothers - great reading.